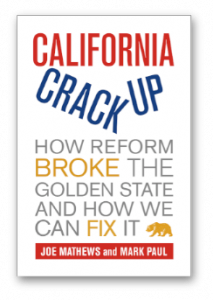 We finally set aside a few hours to sit down with “California Crackup,” the Joe Mathews-Mark Paul collaboration that closely analyzes the state’s political dysfunction, and it was time well spent: they’ve written a terrific book. Cataloging the multiple, inter-locking political elements that caused the collapse of governance in California, the two veteran political writers draw these pieces together into a lucid framework that offers not only a clear diagnosis, but also a serious prescription for what ails the not-so-Golden State. The clarity of their writing and the cogency of their argument put to shame the content of the current campaign for governor. The contrast between their comprehensive, in-depth and detailed take on the state’s fractured political system with the worn-out platitudes mouthed by Republican nominee Meg Whitman and the vapid avoidances of Democrat Jerry Brown underscores the superficiality and lack of substance in the politics of California in 2010. The civic moment is defined by more than bad news. What makes this moment seem different – makes it feel like what Californians call “earthquake weather” – is that California seems unable to talk about the crisis in a way that gets to the bottom of things and points to a better day…At the heart of the civic moment is the fear that California lacks even a language, and an understanding, equal to its calamity. What Mathews and Paul attempt in “California Crackup” is to provide such a language, an effort in which they largely succeed. Starting with an insightful sketch of early state history that shapes and drives their narrative, they make all that follows – the corporate abuse of the ballot initiative system, the unintended consequences and anti-democratic impacts of Proposition 13, the dominance of Sacramento by lobbyists and special interests, the over-reaching of public employee unions, for starters – seem like inevitable developments that year after year have steadily sucked all accountability and integrity out of the system. The whole system must be rethought with an eye to the sheer scale of California, a place grown too large and too various to be successfully governed from the top. 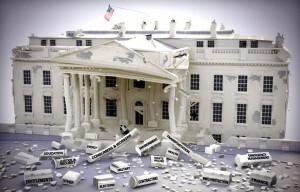 Democracy and accountability would be the buzzwords. Windows must be opened so Californians can see in, peer out, and keep an eye on each other. This will require a Great Unwinding of old rules. 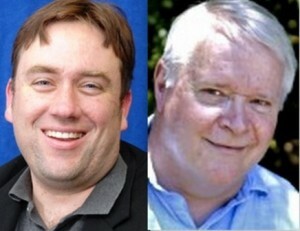 By setting forth an inarguable set of facts and a vocabulary for analyzing them, Mathews and Paul produce a potential shared agenda for change in California that seeks to include those provincial stakeholders — voters, consumers and taxpayers – who were long ago abandoned by the Capitol insider culture of corrupt deal making and fix-is-in demagoguery. 1-Past is prologue: If you don’t have time to read the whole book (c’mon, it’s only about 200 pages) at least pick it up the next time you’re browsing and take a few minutes to read Chapter 2, which presents an intriguing look at the political stumbles, historical accidents and random influences (California’s first constitution was overwhelmingly approved without being read, as the delegates were determined to go home before lunch) on which our current political structure rests. First came the hastily scribbled original constitution, drafted at a rogue gathering convened by the military on behalf of a state the U.S. government had failed to recognize. Second were the three decades of failed attempts to put meat on the bones of that first constitution, culminating in the 1878-79 convention, perhaps the greatest civic disaster in the history of a state with a talent for disaster. Third were the sixty years of amendments, more than three hundred of them, nearly all aimed at remedying the consequences, intended and not, of the 1879 disaster. After a break for the Second World War, fourth came the attempt to edit out the worst of those amendments and turn California’s amateur government into a professional one. California is now in its fifth wave, a breaker that took off in the 1970s and still has not crested: a tsunami of ballot initiatives that, in the name of putting the fear of public anger in California’s professional politicians, threatens the whole enterprise. Two things stood in the way of action. One was a governor more interested in big ideas and the grand sweep of technology and history than in the boring details of tax policy or the grunt work of passing legislation. Brown didn’t want to squander the whole surplus on helping homeowners. “The single biggest difficulty we had was the Department of Finance said ‘you can’t commit more than $300 or $400 million to property tax relief,’” remembers State Treasurer Bill Lockyer, then a member of the Assembly. “It was such a small amount that you really couldn’t provide significant enough relief for people to really think it mattered.” Brown had his own priorities – cutting the tax on business inventories and shooting California’s very own communications satellite into space. A large surplus, at a time when New York City was broke, could be held up in his impending reelection campaign as evidence of his tightfistedness (Brown now maintains that he was holding on to the surplus because he anticipated an economic downturn). 3-Solutions. The boyz get into some neck-deep, weed whacking wonkery in the second half of the book, when they offer up a menu of major reform proposals for starting to fix the broken political system. Putting aside the question of whether actually offering actual solutions for problems is a gross violation of the Political Writers’ Code of Chronic Carping, the Mathews-Paul disquisition on such poli sci matters as proportional representation, unicameral legislatures and instant runoff voting is both refreshing and consequential in its presentation to the reader of two key insights: a) things don’t have to be this way forever – our current system of elections and governance is not only not written in stone, it’s in many ways an exception to best practices elsewhere in the country and the world; b) changing the system in a substantive way requires much bigger ideas than the kind of nibbling-around-the-margins notions offered by California Forward and other small bore reformers. The state’s current stalemate, while a formidable obstacle, is no more formidable than that faced by those who framed the state’s constitution in the 19th century, or than that confronted by the Progressives a century ago, when they elected a governor in the face of opposition from both parties and the railroad. And the changes we propose are far less radical than the Progressives’ push for direct democracy, which represented a sharp break with American history and its Madisonian system of divided government, checks and balances, and suspicion of government. The fall of 2011 will mark the centennial of the 1911 special election in which the Progressives remade the state government’s operating system. It is long past time for an update. Nice work, guys. Calbuzz sez: check it out. They provide that language for the political cognoscenti, which seems to be developing a consensus that system-wide reform is needed. But I would argue this language is still almost completely absent at a street level. This sort of historical narrative and policy wonkery is still too archane for the average Californian. I don’t think this is simply a failure of California intelligence or of getting the message out. I’ve given a boiled down stump speech of their excellent narrative to more people than I could count. And I’ve got the annoyed friends to prove it. PhDs, JDs, you name it–people might nod their head in approval, but the overwhelming reaction is one of lukewarm interest. Not exactly the foundation of a movement to save California. Only the sort of people who read this blog get inspired by improving policy outcomes by fixing California’s broken governance structures. What we need is not a way to convey what Californian’s already know–that California is broken–but a language through which we can make the body politic whole. Luckily, we already have that language: the California Dream–the underlying conviction that, as Kevin Starr would say, because of a place called California, a better life is possible. It’s the humanistic hope that here–in a place so transcendentally and diversely beautiful, so well endowed with natural resources and the most creative people from around the world–we might achieve a good life not in a heavenly tomorrow but here in this world, that we might achieve that City-on-a-Hill that lover of mankind spoke of so long ago. Talk about a constitutional convention as the way to better realize that Dream, to start reconciling the paradoxes that have always defined California–the harsh realities that bely our People’s beautiful Dream, and maybe we’ll get somewhere. Of course, I’m biased: that was the thrust of my senior thesis at CMC, which I expanded this summer during nights / weekends when I was in DC and I am still struggling to turn into something that will (hopefully) be worth reading.